The ultra-quiet fan system is designed to cool home theaters, entertainment centers, and audio video cabinets. Features a speed controller and 6 foot power cord. Included fans use a custom motor engineered to minimize noise during speed variations and are certified by CE, UL, TUV, and RoHS. Containing dual ball bearings rated at 67,000 hours, the unit can be mounted in any direction. 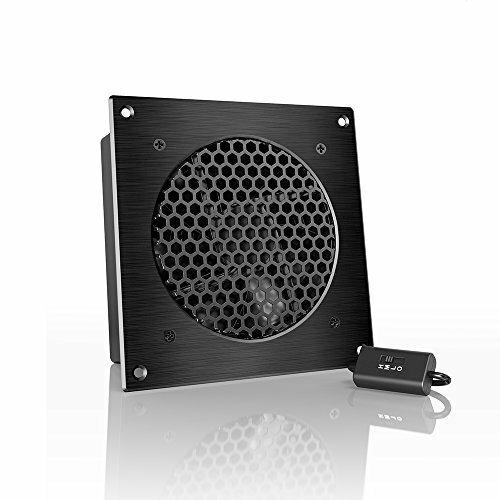 Features a CNC machined aluminum frame with a modern brushed black finish. Fans are set to exhaust air out the frame but this can be reversed to intake air using a screw driver. Includes all necessary hardware to easily mount the unit onto a cabinet and power it through an USB port or standard wall outlet. For cabinets that requires more airflow, each fan unit can daisy chain additional AIRPLATE S series cabinet fans: AIRPLATE S1 (AI-CFS80BA), AIRPLATE S3 (AI-CFS120BA), AIRPLATE S5 (AI-CFD80BA), and AIRPLATE S7 (AI-CFD120BA). Up to six units can share the same USB or wall outlet power source. AIRPLATE S3/T3 contains one fan, AIRPLATE S7/T7 contains two fans, and AIRPLATE S9/T9 contains three fans. Features a multi speed controller to set the fans speed to optimal noise and airflow levels. Powered by wall outlet or USB port, included Turbo Adapter increases performance by 25 percent.